When she was a little girl in Frankfort, Indiana, Brenda loved drawing ballerinas, Cinderella and paper dolls (not necessarily in that order). A creative kid, she used to expand the wardrobes of her paper dolls by creating fanciful costumes for them, sometimes even trimming them with lamp prisms. Years passed and now Brenda Sneathen Mattox is happily back where she started. Drawing, making paper dolls and recreating her subjects as paper doll books. What happened in between times is a tale of an artist meeting her creative destiny. Throughout her school years, young Brenda studied fashion history and honed her skill at meticulously drawing intricate period clothing of the past. After graduating from high school, she packed up her $500 car and headed south to Florida to attend The Art Institute of Ft. Lauderdale where she earned a degree in Fashion Illustration. She returned home and worked as a freelance artist and began collecting vintage clothing. 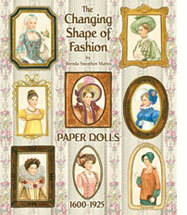 While attending a vintage clothing show in Indianapolis in 1985 Brenda met a paper doll collector who suggested she draw paper dolls with a vintage theme. That was the beginning of a whole new career for the artist. After finding out about the Original Paper Doll Artist Guild in 1987, Brenda immediately joined and then attended her first national paper doll convention. She had found her artistic niche and began by self-publishing “Lydia,” a black-and-white paper doll ith a wardrobe for an 1888 bride. Then Brenda moved on to color in 1991 when her work was published in Doll News. Since then Brenda Sneathen Mattox has become one of the most popular contemporary paper doll artists, widely admired for her exquisite renderings of carefully researched historic and vintage fashions. She currently is a managing editor of Paper Doll Studio. 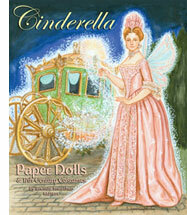 She has illustrated more than a dozen paper doll and coloring books for Dover including Pride and Prejudice, The Importance of Being Earnest, Victorian Family, Corset Couture and Famous Lovers from Literature. Brenda’s love of vintage fashion surrounds her in her home, a beautifully restored 1891 Queen Anne house in Plainfield, Indiana where she lives with her husband, Brian.